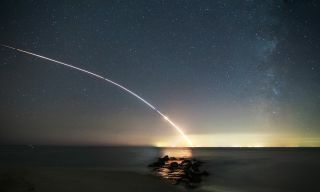 Photographer Chris Bakley captured this stunning image of NASA's LADEE moon probe launch from the beach in Cape May Point, N.J., on Sept. 6, 2013. LADEE launched from Wallops Island, Va., and was visible across a wide swath of the U.S. East Coast. See more amazing LADEE launch photos by SPACE.com readers. Engineers have fixed a technical glitch on NASA's newest robotic moon explorer, bringing the spacecraft back up to full health one day after a spectacular nighttime launch Friday that wowed spectators up and down the U.S. East Coast. NASA's LADEE moon probe launch into space Friday night (Sept. 6) in a flawless liftoff from the agency's Wallops Flight Facility on Wallops Island, Va. An Orbital Sciences Corp. Minotaur V rocket, making its debut flight, launched the lunar probe. By Saturday afternoon, the glitch had been traced to safety limits programmed into LADEE before launch to protect the reaction wheel system, NASA officials said. Those fault protection limits caused LADEE to switch off its reaction wheels shortly after powering them up, according to a mission status update. Engineers have since disabled the safety limits causing the glitch and taking extra care in restoring the fault-protection protocols. "Our engineers will determine the appropriate means of managing the reaction wheel fault protection program. Answers will be developed over time and will not hold up checkout activities," NASA's LADEE project manager Butler Hine said in a statement. "The reaction wheel issue noted soon after launched was resolved a few hours later," added NASA Ames Research Center director Pete Worden. "The LADEE spacecraft is healthy and communicating with mission operators." NASA's Ames center developed and built the LADEE spacecraft, and is overseeing its mission operations. A Minotaur V rocket carrying NASA's Lunar Atmosphere and Dust Environment Explorer (LADEE) lifts off from at NASA's Wallops Flight Facility in Virginia on Friday, Sept. 6, 2013. See more LADEE launch photos on SPACE.com. NASA's $280 million LADEE moon mission, short for Lunar Atmosphere and Dust Environment Explorer, is aimed at studying the moon's thin atmosphere and solving long-standing mysteries of the moon's dust. The atmosphere of the moon, known as an "exosphere," is so thin that individual molecules don't interact with each other. Similar environments have been seen on Mercury, the moons of outer planets in the solar system, as well as some asteroids, so scientists are hoping LADEE will help better understand these strange environments. LADEE scientists also hope the mission will yield insights into the odd "lunar glow" spotted on the moon's horizon by Apollo astronauts during NASA's lunar landings in the 1960s and 1970s. The mission will also track how moon dust moves across the lunar surface, which is key interest because the abrasive stuff can stick to spacesuits and clog up systems on future moon vehicles and rovers. LADEE will take about 30 days to reach the moon and spend 100 days performing its lunar atmosphere and dust mission. The spacecraft will also test a new laser communications system that NASA has billed as a kind of new "interplanetary Internet." At the end of its mission, LADEE will plummet down to the moon and crash into the lunar surface. Email Tariq Malik at tmalik@space.com or follow him @tariqjmalik and Google+. Follow us @Spacedotcom, Facebookand Google+. Original article on SPACE.com.